The Labyrinth Society: Annual Gathering - 2004 Retrospective by Lea Goode-Harris, Ph.D. Wonderful labyrinths to walk, incredible natural beauty including trees that were virtually aflame with color and golf carts — that was the 2004 Gathering in addition to great speakers, good friends, nutritious food . . . 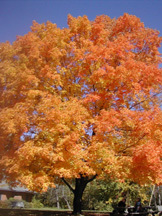 The Fall setting, leaves ablaze with color, was a perfect backdrop for our sixth annual meeting as a society. The art of the labyrinth became evident in the creative t-shirts, tie-dyed and painted by participants; the sound of hand-made drums; artistic expressions on canvas and paper; and labyrinths created on the camp grounds with paint, flags, sticks, and falling leaves. The soul of the labyrinth was found in the contemplation and experience of our craft; networking; in friendships forged, new and old; and in hearing about and witnessing the beautiful labyrinth work that is taking place around the world. Our international panelists Agnes Barmettler of Switzerland, Jeff Saward of England, and Clare Wilson of South Africa presented on the Soul of the Labyrinth. International panelists Jim Buchanan of Scotland, Rachel Roggel of Israel, and Marianne Ewaldt of Austria (via a short movie presentation) presented on the Art of the Labyrinth. Keynote speakers Marty Cain led us in “Circles,” as she took us on a journey of her labyrinth making, Robert Possehl led us through “Community Building” through his walkable labyrinth art, and Jill Kimberly Hartwell Geoffrion led us into the ever “Widening Circle” of the labyrinth community of the Minnesota Labyrinth Network. Writing contest winners were announced, the vendor room was full of labyrinthine merchandise, and the Silent Auction created a lot of activity and generating of funds for our Labyrinth Society scholarships. We welcomed three new board members and thanked outgoing board members, who have served our organization well. There were dozens of informative and interactive workshops to choose from, members’ labyrinth slide show, an open art studio, viewing of the Labyrinth Exhibit, a healing center with massage, morning movement with G/Joan Guilfoyle, and long walks between events to soak up the beauty of Camp Courage. Jonathan Quintin once again mesmerized us with his “Zen of Geometry” and Jim Buchanan set up one of his “Light Labyrinths” in the gym where we walked in and out of shadow and light and danced to the music by The River’s Voice. We were greatly entertained by the Interpretive Dance of the Interplayers, featuring two of our TLS Members, William Frost and Quiana Ele’AnAriel. The Sunday morning “Celebration of Spirit,” led by Mark Heiman and The River’s Voice was moving and replenishing for the spirit. As our time ended, the ever-present golf carts whisked us away to catch the shuttles, which carried us off towards our many diverse destinations. We left Camp Courage inspired, and with many gifts of the spirit to share with our labyrinth communities at home.